May of Solidarity sent a message across Europe: Let’s fight together and build a transnational movement of resistance in and through Europe and beyond! Let’s cross borders in solidarity and build democracy from below! Solidarity beyond Borders – Building Democracy from Below was the motto for a May of Solidarity and Action Days just before the European elections. Launched by the transnational European coordination of and for Blockupy it was a powerful moment of Europe-wide mobilization and solidarity. 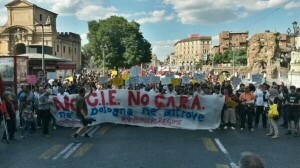 Thousands of people throughout the continent – in Germany, Poland, Italy, France, Belgium, Spain, Austria, Greece and Portugal – took to the streets and demonstrated against austerity policies pushed by the Troika and the EU, against ongoing attempts to privatize commons and public services, against institutional racism fostered by border regimes and immigration laws, against the resurge of nationalism and right wing populism as well as against exploitation, poor working conditions and further neoliberal trade agreements such as TTIP furthering global capitalism. Not by coincidence, May of Solidarity called for action in a time of high European awareness. The aftermath of the European Parliament elections show, with the wide-spread defeat of governments who have overseen the crisis regime for the past five years, a widespread rejection of austerity policies. But there is a stark difference between the success of left forces (as in Greece and, in part, in Spain) which intend to change Europe, and the advance of nationalist and reactionary forces, proposing racist policies of exclusion and the closing of borders. This is another reason why we have chosen the battleground of social movements fighting for a radical transformation, and why the May of Solidarity stands for building democracy from below, a democracy which can be realized only through struggles beyond borders, for the commons, in and for solidarity. We took to the streets and squares in a multitude of actions, building on regions’ existing mobilizations and combining these with genuine shared transnational threads: from blocking the European Business Summit in Brussels to supporting the successful fight of the Greek janitors; from the asambleas and marches of the 15M movement in Spain to the cross border “march 4 freedom” by the refugees; from the mass mobilization in Rome for social rights against austerity and privatizations to the widespread actions across the continent against Monsanto and the introduction of GMOs in Europe; from the marches and actions in different cities to the Tribunal against the Troika in Brussels and to the Transnational Care Meeting in Vienna – May of solidarity has been able to become an umbrella for diverse movements, mobilizations and causes. Europe is a field of struggle and a truly political space we are beginning anew to occupy, struggle for, reconstruct – not unifying under a central banner and logic, but inviting all the multifarious approaches, sites and constituencies to come together to start defining a common framework and acting for and through it. As part of the days of solidarity we value common initiatives and the realization of common threads of actions, such as those addressing the global exploitation chains with coordinated initiatives targeting Apple and Foxconn in different cities, those targeting the border regime highlighting the link between institutional racism, the exploitation of migrant labor and the austerity programs of precaritization. These actions represent an attempt to organize transantionally and in global solidarity, in order to grasp the volatile and transnational nature of global capital that criss-crosses the European space. The richness of the movements and different actions during these ten days testify the potentiality of a transnational movement we have been establishing in past years by acts of solidarity, transantional meetings and common street practice – as in Blockupy Frankfurt. Therefore, we call on everyone anew to join the upcoming discussions and joint practical efforts towards the summer (in Turin 11th July against the EU Summit on “Youth unemployment”) and autumn (in Frankfurt with the new ECB Tower opening), of struggles and beyond. See you on the streets and squares in the upcoming months!